"Mega Man: The Wily Wars, released in Japan as Rockman Mega World (ロックマン メガワールド) is a video game compilation by Capcom for the Sega Mega Drive. The game features remakes of the first three Mega Man games (Mega Man, Mega Man 2, and Mega Man 3) that were originally released for the Nintendo Entertainment System. 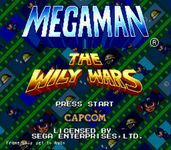 The Wily Wars was released in cartridge format in Japan, Europe, Australia, and Brazil. The North American Genesis version was available exclusively via the Sega Channel service." Source: Wikipedia, Mega Man: The Wily Wars , available under the CC-BY-SA License.